Caring for the seating materials in your vehicle is an important part of interior upkeep, especially when you have leather or leatherette seating. Some people get a little intimidated when it’s time to clean their leather, but we’re here to tell you that properly maintaining your vehicle’s leather seating doesn’t have to be a chore! Take a look at our helpful do’s and don’ts of leather care and keep your vehicle’s interior looking as fresh as the day you got it. Before you begin cleaning, check to see if you have perforated seats. If so, take care to not get any moisture or leather conditioner into the holes. Brush off your seats with a soft-bristled brush to remove any dirt or crumbs that may have accumulated in the seat folds. Always clean your leather using a soft rag, warm water, and mild soap. Using a soft bristled toothbrush, gently scrub any stubborn stains with a water-based leather cleaner. Finish the job by working in a leather conditioner. Never use a hard-bristled brush or vacuum attachment on your leather, as this can scratch it and do irreversible damage. Avoid bringing sharp objects like knives or pens into the cabin, as they can easily puncture your leather. Don’t forget to use a sun shade to protect against discoloration or fading when parking in an uncovered area. For a more in-depth look at proper cleaning procedures be sure to take a look at your vehicle’s manual. 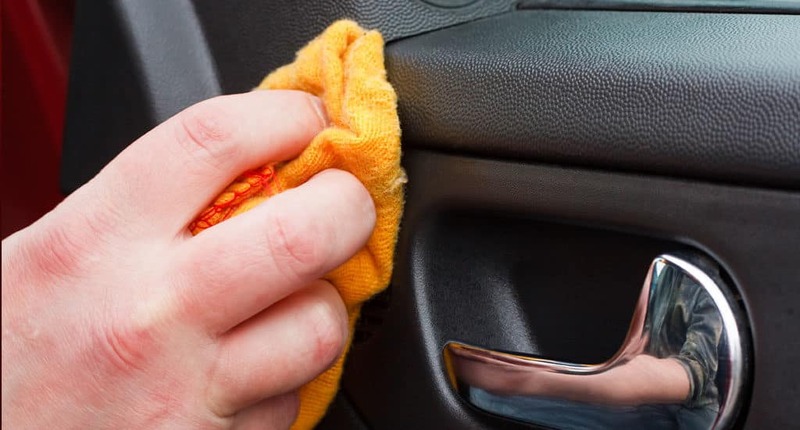 If you would like more helpful cleaning tips, visit the “Tips and Tricks” section of our blog here at Liberty Bay Auto Center.